Spring is slowly arriving in my neck of the woods and I am looking forward to getting back out into the woods. I was going through my files this week and came across this photo taken last November.I love these tight shots were you have only water and rocks.Throw in color and a nice composition is to be had.The above photo is a result of low lighting casting a golden glow on the water and the blue is a result of a clear blue sky. 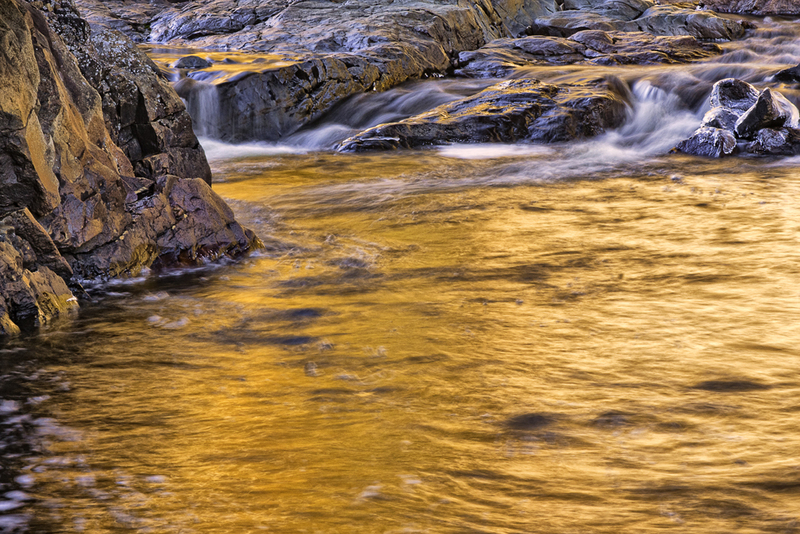 When the lighting is low the rocks take on a soft colorful look to them adding very much to the photo.The only argument to be said about the photo is that there is too much water.I will be going back to this location and shooting with that in mind. The ice on the rocks at the top right add a nice touch.The zoom was set at 80 mm and I had a shutter speed of 1 sec @ f22.